Please contact me if you are interested in having my amazing wife or me speak at your event. I am proud to be a part of World Vision’s speaker bureau. April 4, 2014: “Men of Power: Taking Initiative and Serving,” The Vine Church Men’s Retreat, Madison, WI. March 9, 2014: “Manuscript Bible Study in Mark,” InterVarsity Urban Project, Milwaukee, WI. February 22-23, 2014: “Connections,” The Table Retreat at Christ Presbyterian Church, Edina, MN. February 16, 2014: “The Kingdom of God in Matthew 11-19,” Living Word Fellowship, Whitewater, WI. February 14, 2014: “Technology and Faith,” Rochester Institute of Technology, Rochester, NY. January 29, 2014: “Cross-cultural Ministry: It’s not what you think” (on social media), InterVarsity office’s chapel service, Madison, WI. November 14, 2013: “How to be an Ambassador for Christ in the Digital Age,” InterVarsity at UW-Platteville. October 5-12, 2013: facilitating social media efforts for The Price of Life, New York. September 30 and October 2, 2013: “Building a Life that Matters: Global Concern in College and Beyond,” Cornerstone University, Grand Rapids, MI. Listen to this here. September 20, 2013: “Social Media and God’s Global Mission,” North American Mission Leaders Conference, Dallas. June 7-8, 2013: Chrissy speaks with World Vision Micro at the Collyde Summit, New Jersey. April 24, 2013: “Social Media and Ministry Partnership Development,” The Funding Your Ministry Symposium, Colorado Springs. April 19, 2013: “Home,” InterVarsity at the University of Illinois. January 25, 2013: “Why Does Human Trafficking Exist and Why Does InterVarsity Care?” at the University of Buffalo. Click here to listen. 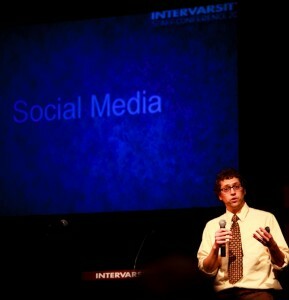 November 29, 2012: “Missions: What a Waste,” InterVarsity at UW-Whitewater. My wife, Chrissy (author of Into the Mud: Inspiration for Everyday Activists, True Stories of Africa) and I frequently speak together. We tell stories from our years in Nicaragua, China, and South Africa, telling of tractor rides with malaria, baseball princesses, cross-cultural mishaps, crashing motorcycles, bribing border officials, and lessons from our friends in hard places. Themes we often speak on include international poverty, personal risk, microfinance, cross-cultural communication, leadership, and Christian faith. Together, Chrissy and I have written This Ordinary Adventure: Settling Down Without Settling. I also speak on these themes alone, as well as on the effective use of social media for good, for both nonprofits and individuals. Yes, I Actually Believe Jesus was Dead and then Alive. I Need a Date With a Good Man in the Next 72 Hours. (It’s for a Friend.) Please Share!